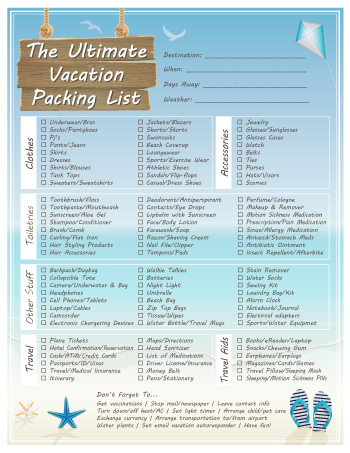 The Ultimate Vacation Packing List – Free Printable – Now that all the fun and craziness of the Christmas holidays are behind us, we’re hit with the realization that we still have quite a few more months of winter to go. I’m not a fan of long, cold winters (well, it doesn’t get below freezing often where I live but it rains a lot) so we try to save enough money for a vacation to a sunny destination each year. I don’t know about you but I absolutely love winter vacations – I mean I plan for it all year long. If I could only do one thing for the rest of my life, it would be to travel. I love experiencing other cultures, landscapes and food and I think travelling is the ultimate education. This year we’re so fortunate to be going to one of our favorite destinations, Mexico (Manzanillo to be more precise). A big part of what I love about going on a vacation is the build-up and excitement before we go. I usually have everyone’s luggage pretty much packed about a week before we leave – I know, I have issues. Every year I go through my mental packing checklist but inevitably forget something. Since we’re leaving shortly I decided to create my own printable packing list that I can pull out and print every year now from this point onward. I thought many of my fellow travelers may like to have this checklist too. To download your free printable packing list click here. Happy travels! Subscribe to Dabbles and Babbles to receive the latest crafts, activities for kids, recipes, printables, tutorials and more – subscribe in the right sidebar. You may also want to check out my popular Pinterest Boards and Follow me on Pinterest. Such a great and complete packing list! I am definitely gonna print it and use it every time I go somewhere. Thanks a lot for sharing! Thanks Hattie, I agree. I’m going to be using the packing list in 39 days for my trip to Mexico! I totally need packing lists when I travel. Enjoy!